If psychology could explain everything, there was one aspect of the self that held special importance to the intellectual and policy worlds: open-mindedness. Open-mindedness was a kind of mind characterized by autonomy, creativity, and the use of reason. To the scientific experts, intellectuals, and policy makers who developed and utilized the concept of the open mind, this type of self served simultaneously as model and ideal of national and intellectual character. They projected upon the open mind their aspirations for the American character and liberal pluralist democracy, for scientific thinking and true intellectual inquiry. Indeed, for some of these individuals the open mind transcended the academic and political, as its traits were even conscripted to serve as criteria for human nature itself. Cold War intellectuals and policy makers saw in open-mindedness solutions to the most pressing problems faced by the nation. Those who defined American foreign policy believed that open-minded autonomy, a hallmark of American virtue, posed a threat to the communist system. Traditional or authoritarian societies could not be sustained in the presence of a citizen body that thought autonomously, but for a modern democracy like America, open-mindedness would have the opposite effect, offering social cohesion. The open mind meant a respect for individuality, tolerance of difference, appreciation of pluralism, and appreciation of freedom of thought. If citizens were sufficiently equipped with these virtues, thought policy makers and social critics, the nation would flourish. 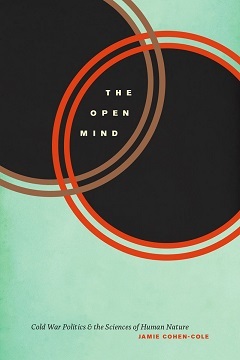 The various traits associated with open-mindedness reinforced one another and became organizing features of Cold War politics and intellectual life. Yet even when Americans agreed on the importance of freedom of thought, determining the specific characteristics of free thought was not easily done. It was only through concentrated attention to the pressing national problem that experts, educators, policy makers, and public intellectuals came to develop a common language through which they understood the cognitive virtues sibling to free thought. The concept of the open mind did not spring fully formed at the dawn of the Cold War era but was rather invented as a characterological umbrella that could unify the political and intellectual desiderata of the time. By studying the process of invention, that is, the efforts made in scientific and other contexts to understand, define, measure, and explain autonomous thinking, we can better understand the role of the open mind in shaping the intellectual, social, and political life of Cold War America. That role, as this book will demonstrate, was central, a success indicated by the way in which the virtues of the open mind became, for a time, nearly invisible norms of American culture. . . . . Understanding the political meanings of open-minded autonomy accordingly sheds new light on the political and cultural significance of cognitive scientists’ argument that humans are autonomous and not simply products of their environment. Existing histories either do not focus on the constitutive role of the politics of autonomy in the cognitive revolution, or they deny it. Where historians of science and scholars of science studies have considered the political implications of the sciences discussed in this book, they have centered their attention on military funding and the RAND Corporation. As a consequence these histories present a clear and direct connection between the forms of human reason analyzed in the sciences and Cold War military imperatives. However much funding for social and cognitive science of the Cold War period came from military or civilian government sources, it is nevertheless also the case that the cognitive revolution and significant segments of social science operated on a much broader political register than those defined by military concerns. Identifying the constitutive role of the open mind in Cold War America highlights the fact that the sciences had no simple relationship to the state and military. Far from being devoted primarily only to fighting communism, or to command and control technologies, the open mind was intended to make Americans more liberal. Recognition of the specific political values attached to the open mind also shows the ways in which Cold War culture was internally divided. By giving attention to the development and application of the scientific techniques that defined open-mindedness, this book explains the establishment and subsequent unraveling of Cold War centrism. I offer an analysis of Cold War culture and the maintenance of its apparent consensus by tracking the tools of psychological analysis through which intellectuals produced the very conformity that they feared. It was not Zeitgeist, nor hegemonic ideology, but specific psychological technologies that assigned non-mainstream ideas to irrational ideology, thereby helping to produce consensus and conformity among the remainder of people—those who held “rational” ideas. Psychological technologies deserve their own attention because they cannot be reduced to particular ideologies. Although scientific tools for describing human nature developed in and supported a very specific political order, they were not tied inexorably to Cold War centrism, a particular domestic social system, or even to a specific foreign policy. In fact, the very same scientific tools and modes of social analysis that had been used during the 1950s and early 1960s to police the boundaries of what counted as acceptable or reasonable political debate became potent weapons to crack the centrist political order. Members of the New Left and Second Wave feminist movements repurposed the scientific vision of rational selfhood to challenge rather than support the status quo. The Left’s successful appropriation of centrist political tools led some prominent intellectuals to abandon their former affiliation with liberalism and identity as neoconservative. Conservatives, for their part, undermined one of the pillars of liberalism by pointing to the political and ideological significance of human nature as described by the cognitive and social sciences. With this attack, conservatives managed to break the connection between human nature and the values of Cold War liberalism. In the last decade, historians of conservatism have aptly contended that these modes of psychological analysis, so prevalent during the 1950s and 1960s, obscured rather than illuminated much of what was important and significant about the rising right-wing political movement. But however inappropriate 1950s psychological analysis may be for understanding the history of right-wing politics, we must go further than dismissing these psychological tools out of hand. For to do so is to misunderstand the mechanism and measure of modernity in centrist and liberal social thought. If these psychological tools are less than reliable for the analysis of the right, once we move past declaring them simply accurate, inaccurate, or mere reflections of hegemony, we can disassemble and inspect them. By doing so we can recover the mindset and social imagination of the people who made and used them to construct a central part of the intellectual and political culture of the Cold War. To read more about The Open Mind, click here.